In 1890/91 the twenty-eight-year-old Gustav Klimt executed a number of paintings to decorate the spaces between the columns and above the arcades along the north wall of the KHM’s main staircase. The committee in charge of the newly-built Imperial Museum of Fine Arts (today the Kunsthistorisches Museum) had commissioned a series of forty paintings from a group of young artists called the Company of Artists – Gustav Klimt, his younger brother Ernst, and Franz Matsch – featuring different periods of art from Ancient Egypt to the 18th century. Personifications – either male and female, or female only – symbolize different stylistic periods, regions or centers of art. Pose, costume and selected objects perfectly reflect style and artifacts typical of each period. Gustav Klimt contributed a total of thirteen paintings. All were executed in oil on canvas in the Company of Artists’ communal studio; in 1891, six months before the formal opening of the museum, they were glued to the wall of the main staircase. Gustav Klimt (July 14, 1862– February 6, 1918) was an Austrian Symbolist painter and one of the most prominent members of the Vienna Secession movement. His major works include paintings, murals, sketches, and other art objects. 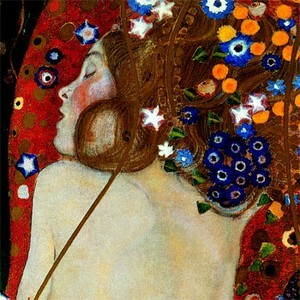 Klimt’s primary subject was the female body.